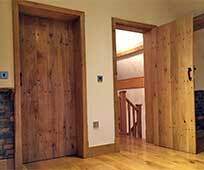 American Tulipwood or Poplar is very easy to work with and is a popular choice for internal joinery including doors. It is not very durable and so not often used for outdoor projects. Family: Magnoliaceae Yellow poplar, tulip poplar (USA); tulip tree (UK and USA) ; canary wood, canary whitewood (UK). Note: The BSI standard name, whitewood, should not be confused with the softwood of that name, nor should the American trade name, poplar, be confused with the true poplars, Populus spp. Liriodendron is associated botanically with Magnolia spp., both trees carrying tulip-like flowers. Eastern USA and Canada. 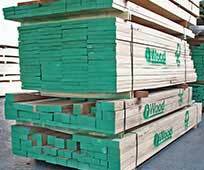 Owing to the enormous demand for the timber in the past years, supplies at the present time are limited. A large tree attaining a height of 37m or more, and a diameter of 2m or more. The sapwood is white, and in second-growth trees, very wide; the heartwood is variable in colour, ranging from olive green to yellow or brown, and may be streaked with steel-blue. The annual growth terminates in a white band of barenchyma, giving a subdued figure to longitudinal surfaces. 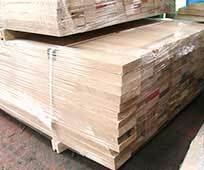 The wood is straight-grained, fine-textured, fairly soft and light in weight, about 510kg/m3 when dried. Dries easily and well with little degrade. Similar to idigbo (Terminalia ivorensis) in general strength properties. Easy to work, and finishes to a fine, smooth surface. Takes nails without tending to split, glues well, can be stained, polished or painted and holds hard enamel finishes excellently. 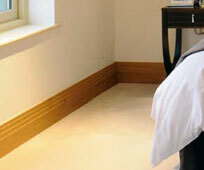 Joinery, including doors, interior trim, light construction, boats, toys and plywood.